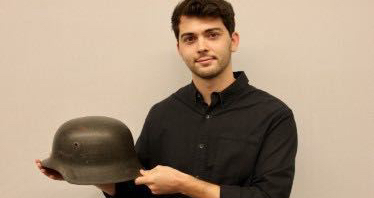 William Perez, a junior international business and entrepreneurship major, started a personal company that searches for old war belongings and reunites them with soldiers. At age six, Perez grew up listening to his grandfather’s stories of his time in the Army. It was his stories and Perez’s imagination that founded his addiction to militaria. At a young age, he was fascinated with hearing his grandfather’s stories and he always searched for artifacts that may have been his grandfather’s. It’s because of this that Buy Sell Research (BSR) Militaria was formed with an aim of ﬁnding and selling antique militaria while also preserving each piece and its history. Before starting BSR Militaria, he became invested in the collecting community in which he rapidly became very popular in. BSR Militaria oﬀer an interactive website that allows the sale of Military Antiques, including German and Japanese World War II items. As most websites prohibit the sale of these items, they are one of a select few to publicly oﬀer these items for sale, as well as a free-to-use price guide. Other interesting artifacts that are currently in his collection are pieces of rugs, a painting captured from Saddam Hussein’s bedroom, unseen and documented photo albums from a security guard and knights cross (Germany’s equivalent to medal of honor) holder who was detailed to guard Adolf Hitler, and a few helmets that were used in and captured during the invasion of Normandy. He’s constantly balancing business, school and social life. For this reason, Perez has started hiring UT students as interns. “This way I can offer invaluable work experience to a student on campus, and also focus more on the important aspects of the business,” Perez said. Perez’s greatest inspiration is Giles Hertz, associate professor of business law and entrepreneurship at UT. “It was his words which motivated me to take the next step in transforming my hobby into a business,” said Perez. Items sold through consignment are not protected under any lifetime return policy that some vendors may hold at BSR Militaria. They oﬀer a 30 day inspection period for returns once the item has been received by the buyer. Perez explains the process that needs to be followed in order to cosign with the B.S.R Militaria. Once the pieces are submitted, they are photographed, cataloged, and priced. The next step is to confirm whether or not the price of the pieces corresponds with any expectations, followed by the final sale. Additionally, BSR Militaria also permits a 30 day inspection period to check for any damaged items.